The Ohio Bicycle Federation’s Board of Trustees has been working on a number of improvements to Ohio’s “Bike Laws” including a “3 Foot Law.” On September 28, the 3′ Law was introduced in the Ohio legislature. The OBF is working with Ohio State Sen. Teresa Fedor, a Democrat from Toledo, who became the primary sponsor of the BIll and who introduced the bill tothe media along with Mark Wagoner, a Republican, at a press conference on the Statehouse lawn on September 28. While the law is not without problems, and critics, already, its introduction is an indicator of a renewed interest in Safety in Columbus that bodes well for cyclists. Regular Session . B. No. 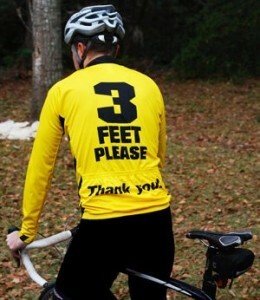 be not less than three feet. vehicle or trackless trolley being overtaken and passed. section is guilty of a misdemeanor of the third degree. BIKE LAW 101- What Do MAIDS Have to do With MOTORCYCLES??? It is not clear form your article if this is an active law or simply a bill that is proposed but yet to be voted on. Could you clarify. Thanks for the note Gary. The Three Foot was set to be introduced last week – however, at the last minute the Three Foot Law and another bike law proposal were added to a huge budget bill that is percolating in the House right now. This is an excellent result since we KNOW that bill is going to pass- however, the amendment can be excised by opponents, so we’ll be watching closely and fighting hard to keep this in the bill. A. Three Foot Laws are currently IN PLACE in Cleveland, Cincinnati and Toledo in the municipal code, and are being considered in other cities. B. At the State level, there is no separate Three Foot Law bill, however, the Three Foot Law is pending as an amendment to another bill!